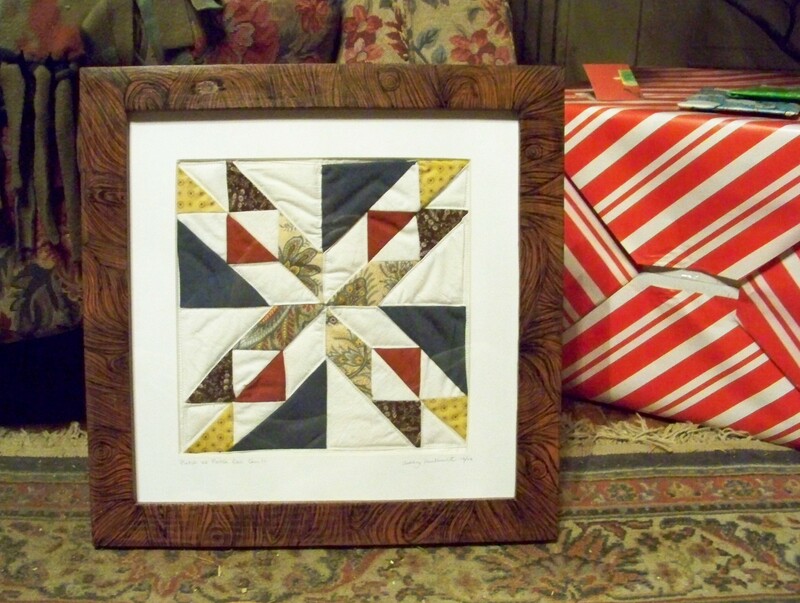 Framed quilt squares make great handmade gifts and you don’t need to be an expert quilter to create one. 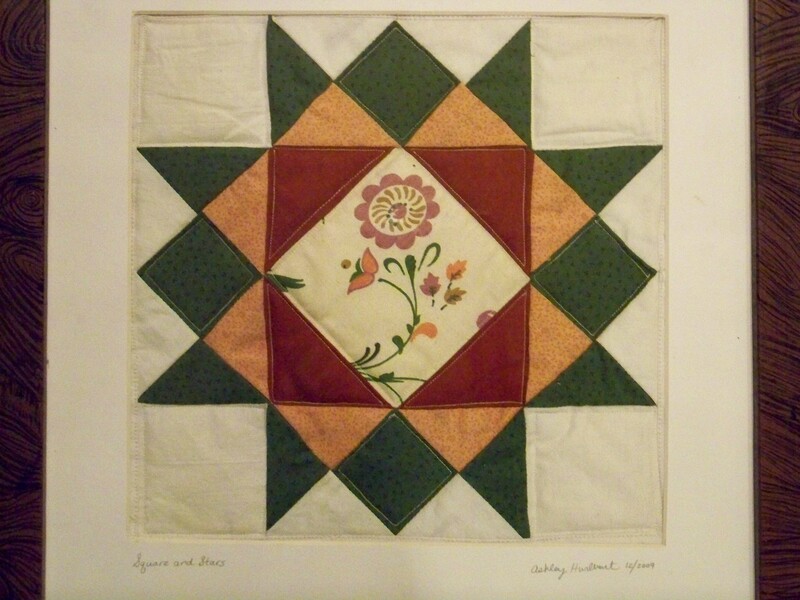 First find a quilt square that you like, keeping in mind the size of frame you intend to use. 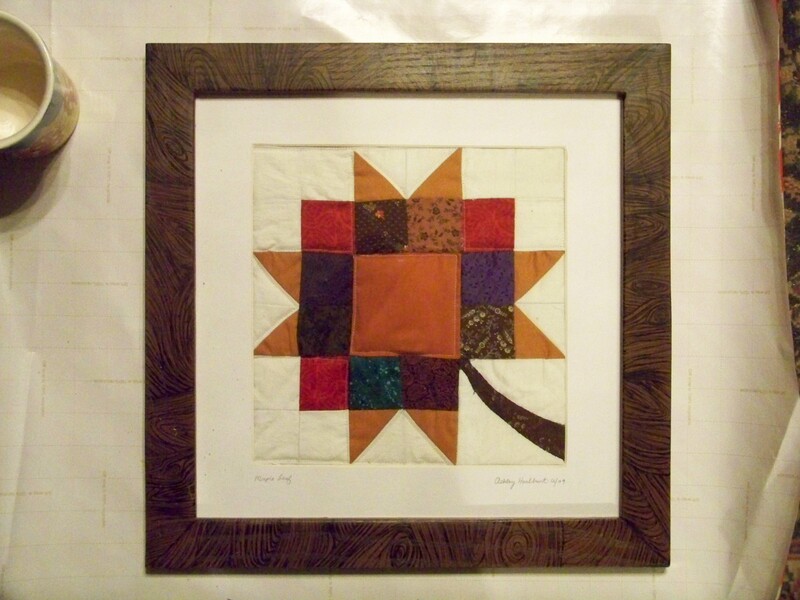 Many quilt square designs can be found online, check out McCalls Quilting for ideas. The best part about these quilt squares is that they can be machine sewn and quilted! Once you have determined the design and size of your quilt square, now comes the fun part, picking your fabric colors/patterns. 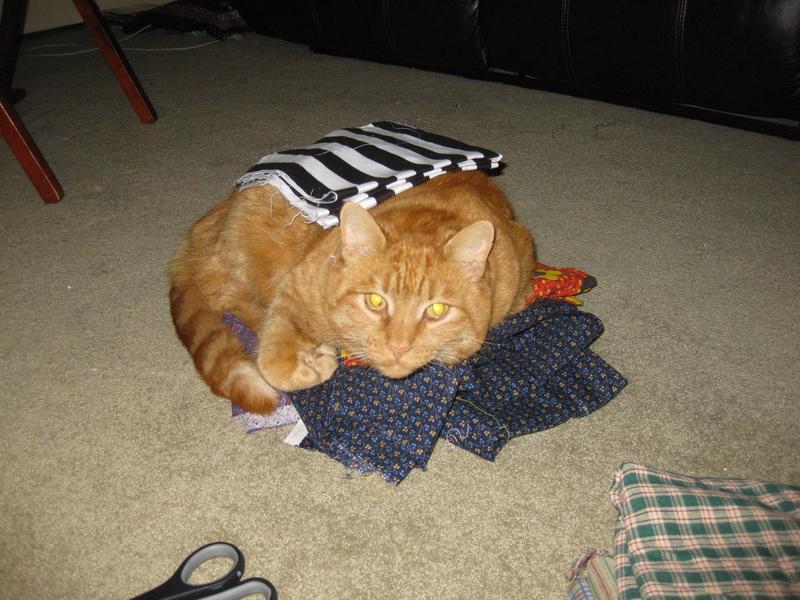 This always takes some time, I usually gather up all my fabric and spread it out on the living room floor, which Lewis (my cat) loves! Once you find your signature fabric the others usually come easily. If you don’t have fabric it is always fun buying it new, but fabric can be found at thrift stores, garage sales and you can even cut up that old shirt you can’t bare to throw away (as long as the fabric is still stable). Or swap some with a friend! After you have found your fabric gather them together and prewash with mild soap either in your sink or for large pieces in the washing machine. Dry the fabric and iron, if you prefer use some starch to stiffen it. 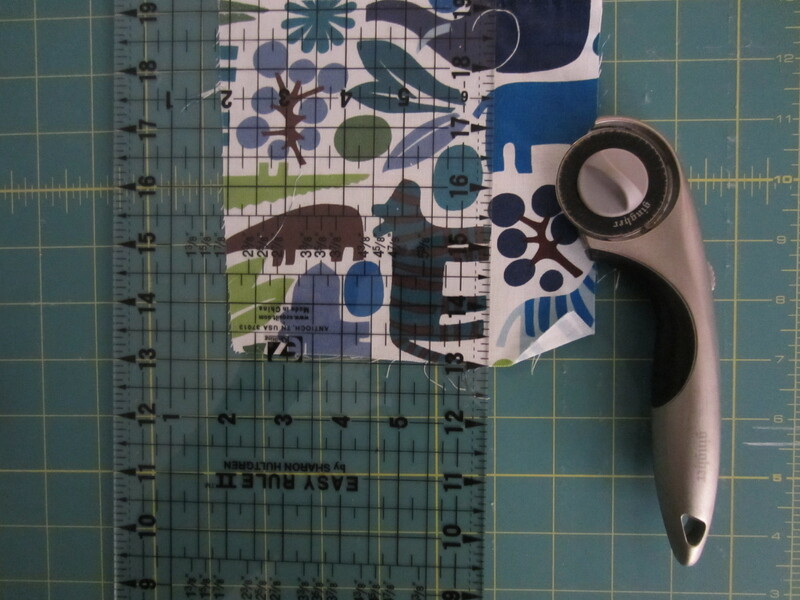 Now it is time to measure and cut your fabric. Follow the instructions carefully, it is always best to read through the instructions first. Use a rotary board, cutter and ruler to cut accurate pieces out relatively fast, it is actually fun too! If you prefer use a marking pen/pencil to lay out the lines to get an accurate cut. 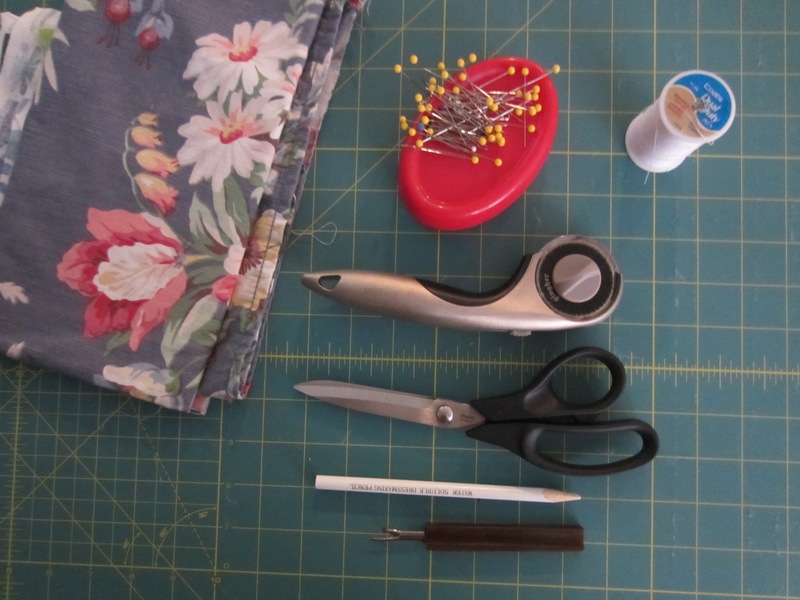 Once you have your fabric cut, pin your pieces together and now you can begin sewing, keep in mind your seam allowance. If you don’t know how to sew, many community colleges, fabric shops and some library’s offer sewing classes. Also, you can check out your local 4-H office. Or if you run into problems, reach out to us here at FarmHouse we would be happy to help! Now that your pieces are sewn together, trim any strings and iron both the front and back of your quilt square (pressing the seams to one side). Since the quilt square is going to be framed there is no need for batting, but if you prefer a “quilty” look, add batting and quilt using your sewing machine. 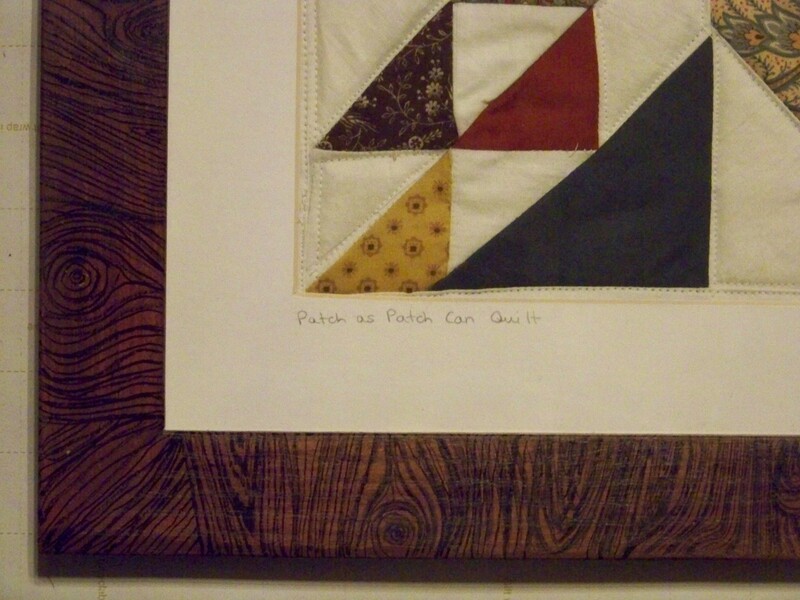 Determine what type of quilting technique you would like to use, straight line such as “stitch in the ditch” or a 1/4 inch around each piece like I did here. Or free motion quilting were you can create your own design! These frames were made in my mom’s wood shop out of pine and I really wanted to give them a faux grain look, but couldn’t exactly figure it out even after reading several books and articles (if anyone has any suggestions I would love to hear them). I ended up painting the frames to give them the look I wanted. There are many quilting books, and some great miniature quilt books, here are a few suggestions Marvelous Miniatures and Pint-Size Traditions. 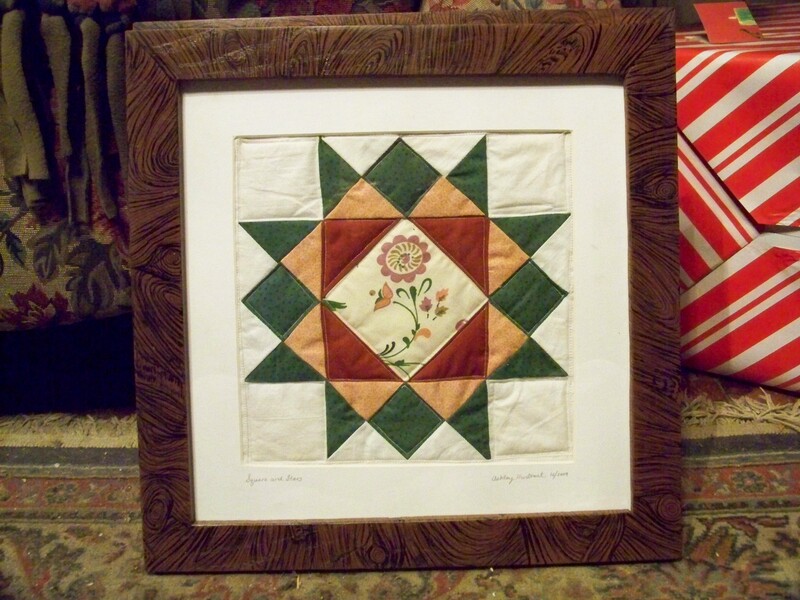 Also check out, The Piecemakers Quilt Group. 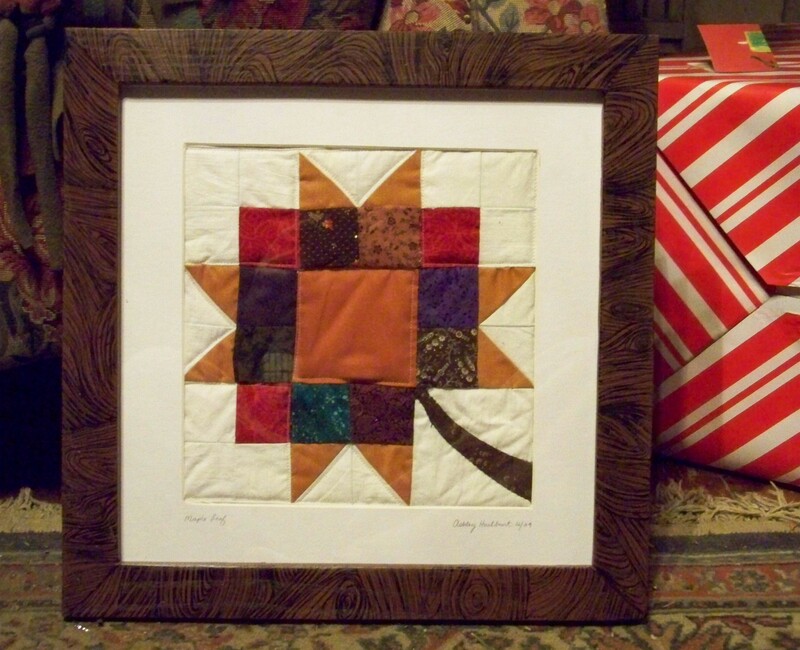 1) Framed quilt squares are a super cute idea, especially for people like me who LOVE quilting fabrics, but are super-intimidated by full-sized quilts. 2) HOLY CRAP YOU PAINTED THAT FRAME? You are one seriously talented lady.